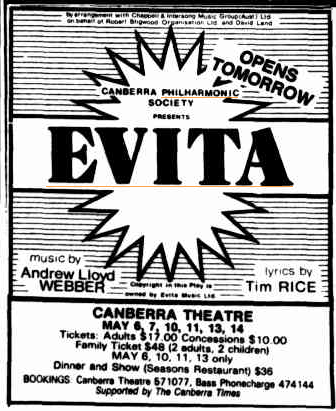 The last time Evita was performed in Canberra, as far as we're aware, was in May 1988. A Canberra Philharmonic production ran for 6 performances at the Canberra Theatre. Jillian Donaldson starred as Eva Peron, with Stephen Fisher as Che and Phillip Dodd as Juan Peron. The production was directed by Stuart Maunder, with musical direction by Colin Fischer, choreography by Sami Shalom and costumes by Veronica Dzelde. Tickets were $17.